Singleton Council have known their pound was a shithole since animal advocates started reminding them of the fact, nearly a decade ago. "... it goes back to 2010 when we were trying to get into the pound to take photos. The council wouldn't even talk about it until the local newspaper did a report about it... the pound is in breech of the relevant codes of practice and has been since it was built some 20 to 30 years ago. Six years ago the business about a greyhound took place. Complaints were lodged with the RSPCA but they did nothing (see link: http://www.theherald.com.au/story/466835/anger-over-distressed-dogs-rescue/). This is also a local government matter as the Impounding Act states clearly that the council has to have a pound where minimal standards must apply including vet care, food, water, etc. But the issue here comes down to one of enforcement. No-one is prepared to do it especially the RSPCA NSW. Meanwhile the Office of Local Govt is likewise just as useless. Maybe the Ombudsman needs to be brought into it." And today, thanks to the attention of the Animal Justice Party in NSW, council is again having to defend their abuse of people's pets in the media. Singleton Council has again defended itself over the state of its animal shelter after the NSW Animal Justice Party labelled conditions at the pound “appalling”. The AJP said it would make a formal complaint to the RSPCA and demanded council immediately upgrade the facility. 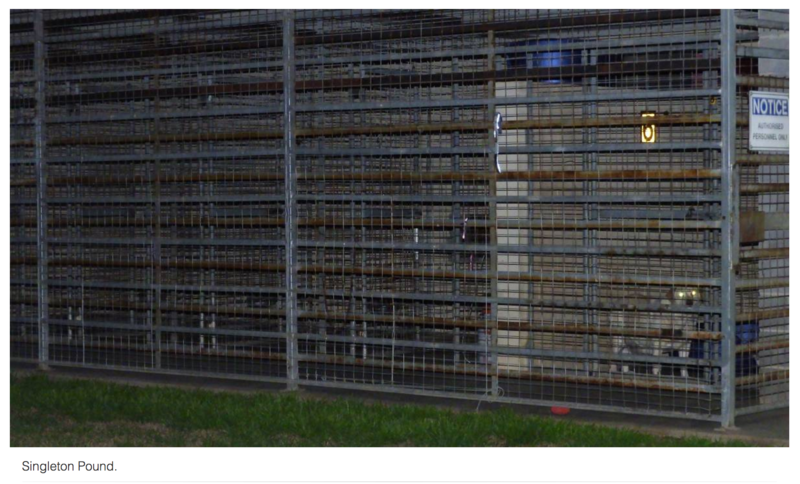 It came after an AJP member visited the pound and took a photo of a dog in a cage that the party alleges was unprotected from the elements, had no raised bed and no blanket or jacket for the canine. “The council-run pound is completely inadequate and fails the most basic of requirements to ensure animals do not suffer because of exposure to the elements,” AJP Hunter spokesperson Joshua Agland said. “I agree the golden Labrador is there through no fault of her own and I would again encourage responsible pet ownership,” she said. "Responsible pet ownership"; you can almost count down the minutes until a defunct, uncaring council will bust that one out as some kind of a defence. ... If you people would just stop needing the community resource that is the local council pound, we would no longer have to leave pets freezing and neglected, sleeping on concrete in the rain. Not our fault... we're doing all we can. Yeah, yeah. FIX YOUR CRAPPY POUND ALREADY. Council is committed to ensuring the welfare of all animals while at the facility and in the re-homing process,” (a council) spokesperson said. Singleton is yet to lodge their performance statistics with the DLG. Assumedly because they don't want animal advocates to get their knickers further in a twist with actual details of their operations, since they abandoned their internal rehoming program last year and now rely exclusively on rescue to save the lives of pets. Rather than commit to giving this issue the attention it deserves - Council have planned a review of the pound in two months time. A report will be tabled for councillors in September regarding plans for a new animal shelter. Considering council have been talking non-stop about doing something, while doing absolutely nothing since early 2016 I'm sure this will come as no comfort at all, to the pets currently freezing in the pound. Saving Pets - Feeling the cold? Take a moment to think about the animals in Singleton Animal "Shelter"
"Singleton Council pound (NSW) is what those in the animal rescue biz like to call a CRS... a Classic Rural Shitbox. In early 2016, animal advocates in the community started to complain to council that their pound wasn't meeting the community expectations that a facility given the responsibility for caring for lost, family pets should be meeting. Mainly that the pound was open to the weather and pets were exposed to the elements." "Council claim the facility was only ever supposed to be a ‘temporary’ solution... Animals are exposed to the elements and the regular weather extremes of heat and cold. This week local animal advocates have amplified their ongoing complaints over animal care, as the dogs in the facility have been without beds and were sleeping on the concrete floors. In winter. And while beds that were sourced and donated, sat unused."